All Events are Free + All are Welcome! Hosted by Pedro Tuyub & Ricardo Tavarez at SFPL Mission Branch. Literary translators, writers, professors and students discuss the dynamics of translating literature. Panelists will address common issues with translating literature and poetry. Word choice, syntax, context and literal meaning will be among the topics covered. This panel features Mayan translators from Guatemala and Mexico including Ismael Chel, Francisco Icalá, Karent Novelo, Maria Gloria Robalino. 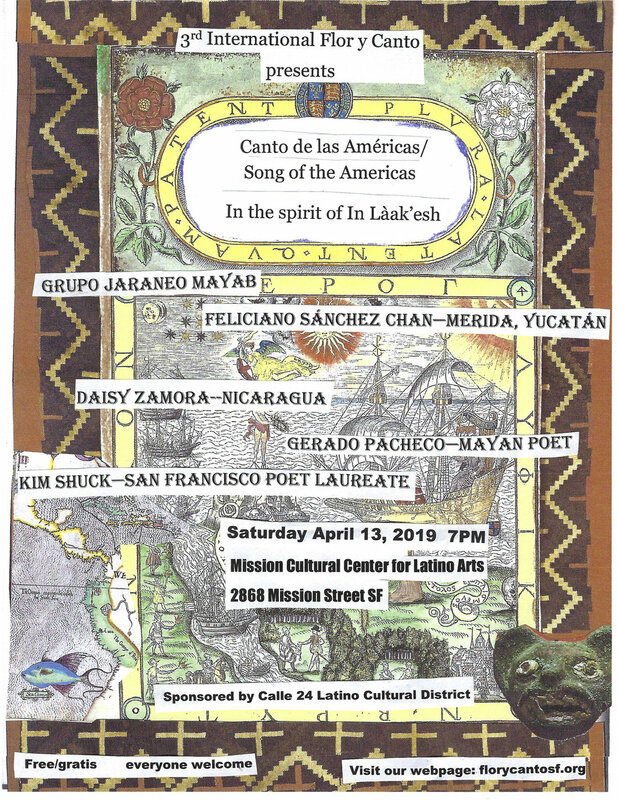 The 3rd International Flor y Canto Festival is pleased to present our featured reading “Song of the Americas/Canto de las Américas—In the spirit of In Làak’esh. The closing night of the festival is dedicated to the memory of Luis Góngora Pat, a Mayan worker assassinated by San Francisco Police on April 7, 2016. The event opens with a dance and music performance by Grupo Jaraneo Mayab—followed by a reading by: Gerado Pacheco, award winning Mayan poet, Daisy Zamora, internationally acclaimed Nicaragua poet, Kim Shuck San Francisco Poet Laureate and the invited guest from Merida, Yucatan, the literary and culture maestro, Feliciano Sánchez Chan, who will read in Mayan and Spanish, with English translations. Hosted by Alejandro Murguia. Featuring: Feliciano Chan, and San Francisco Poet Laureate Kim Shuck.